This module has been integrated to the software, it’s a phpBB based module. You can create your forum topic, allow your users create their topics and post there their comments. Admin forum management allows Administrator to take full control over this module. If the student is subscribed to a course he will be able to see the same forum topic, other forum topics won’t be available for this student. There is a checking for course and forum IDs, according to it the student will or won’t be able to view this or that course. New forum topics that don’t correspond to the existing courses won’t be visible for students. When clicking on “Forum” you will see a left side menu with options available for Admin. The first menu items allow Admin check the forum overview. Admin Index shows statistics on number of posts, topics, users, on their number per day etc. You will also be able to check which user is now in the forum. Forum Index displays an index page of forum as it is shown to user. Preview Forum is an option to preview forum page. The section “Forum Admin” is created to let Admin manage posts, topics and users. Management – is an option that allows Admin to edit, delete, move the posts up or down and resync them. If you select one of these types in the menus for exact option, such users will only be able to take this action type. Pruning – the same meaning as removal. Here you can set a number of days after that the topic with no answer will be deleted. If the topic has poll, announcement it won’t be deleted. Admin will need to remove it manually. 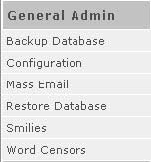 This section allows Administrator to make a back up of the forum database and restore it, just general settings. Backup Database – database backup (full database or just only data), with compression or not. The file will be saved to your computer. Configuration – is an option to let Admin define general settings like General Board Settings, Cookie Settings, Private Messaging, User and Forum Basic Settings, Avatar Settings, COPPA Settings, Email Settings. Restore database – here you will be able to restore a database backup that is located on your PC. The structure should be the same as the current database structure. Smilies – the list of available smilies that users can use when posting to the forum. You can add your own symbol combinations for emotional expressions. automatically censored on your forums. In addition people will not be allowed to register with usernames containing these words. Wildcards are accepted in the word field. For example, test will match detestable, test* would match testing, *test would match detest. This section allows Administrator to create and manage Forum Groups. Management – a section where Admin can manage users groups. You can delete, create and edit existing groups. You may choose moderators, toggle open/closed group status and set the group name and description. Permissions – Here you can alter the permissions and moderator status assigned to each user group. Do not forget when changing group permissions that individual user permissions may still allow the user entry to forums, etc. You will be warned if this is the case. Note if you set permissions not for all, not all your users can access to forum topics. Add – The list at this page contains all the themes that are available for the templates you currently have. The list can be empty if the items have not yet been installed into the phpBB database. To install a theme, simply click the install link beside an entry. Create – the form helps to create a new theme for a selected template. When entering colors (for which you should use hexadecimal notation) you must not include the initial #, i.e.. CCCCCC is valid, #CCCCCC is not. Export – In this panel you will be able to export the theme data for a selected template. Select the template from the list and the script will create the theme configuration file and attempt to save it to the selected template directory. If it cannot save the file itself it will give you the option to download it. In order for the script to save the file you must give write access to the webserver for the selected template directory. Management – here you can edit existing templates and their themes. The scheme is the same as creation of the theme. Just alter the needed fields and the changes will be automatically saved to the theme. This section allows Administrator to manage forum users, you can (un)bun users, names etc. Ban Control – this is a management tool that will allow Administrator to (un)ban specific users, IPaddresses, email addresses. This will prevent users from joining the forum board according to their name, IP or email address. Disallow names – you can set names, that cannot be used for registering, these names can contain wildcard character *, that matches any character. If there is already such name in the database you won’t be able to disallow it, only new names are allowed. If you changed your mind on a specific name, you can delete it from the list using a panel here. Management – this option allows Administrator to change other users’ settings, like signature, showing their email, online status, reply notifies, board language, time zone, date format. This information is presented the same way as in User’s Forum Profile. You can change his/her settings from Admin Panel. There are also settings on user’s activity, private messaging permission, avatar permission, rank title. Permissions – you can set here a status for specific user, if he’s just a user or administrator. And also you can assign selected user as moderator to the specific board discussion. Advanced mode shows you all permissions that can be set up in the section Forum Admin > Permissions. Ranks – here you can add additional rank for users, you can set a minimum posts for this rank and add rank image. Your users will get this rank after adding a specific number of posts indicated here. Like newbies etc.